For outside pictures the direction of the light at the time of day you take them determines how good the pictures will turn out. Of course the weather conditions will also be a factor. People like lots of sunshine but there is a problem. Direct overhead sun creates what is none as racoon eyes when photographing people! WORST TIME OF DAY! Photo Taken just before Noon with direct overhead sun causes Racoon Eyes shown here with this selfie picture of me. Stay many hours away from High Noon when taking people pictures outside on a sunny day! In addition to the dark eye shadows, the shiny spot on my head from the direct sunlight does not look good. Also people tend to squint when the sun is in front of them. The longest day of the year is June 21st. Today is July 2nd, and Sunrise is at 6:12 AM and Sunset is at 9:07 PM. Some photographers like taking pictures at the golden hour times. Today the golden hours are 6:12-7:15 AM and again at 8:04-9:07 PM. Photographers that use only natural light like to stay closer to these times. The location determines which time to use? Having the sun low in the sky and behind my subjects as I photograph them is best done early in the morning or late in the evening. And this also determines the location. 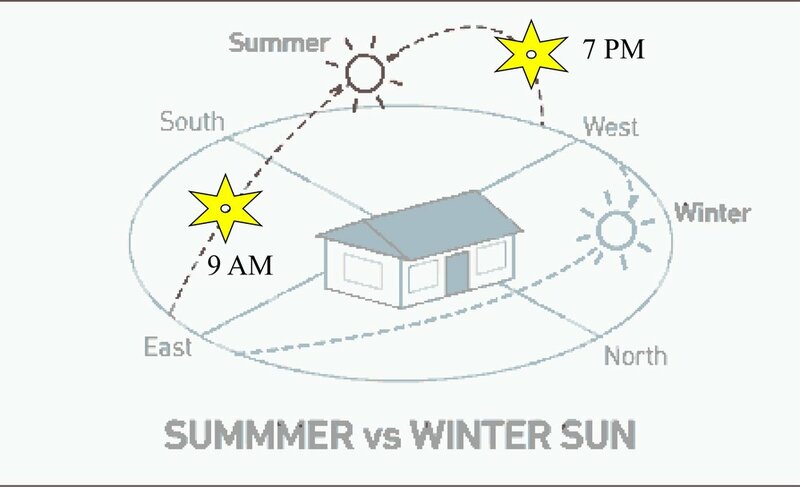 In the example diagram above, the time of day determines whether I'd use the East or West side of the house for a backdrop. For 9 AM Portraits I stand people on the West side of the house. This keeps the sun behind them. And for 7 PM Portraits I stand people on the East side of the house. I typically do a "GO SEE" before deciding on a good location for photos. As I can then determine where the sun will be and how the background will look. It does not matter if a house, field, or wooded area are used for a backdrop, the concept is still the same. Note: The Best Times for taking Outside Photographs change with the Seasons. Mostly the Evening time changes to an earlier time. October 1 it changes to 6 PM and November 1 it changes to 5:30 PM (4:30 PM after Daylight Savings time kicks in). And on December 1 the Best time becomes 4 PM. Back lighting photography has become very popular these days. Watch 3 minute Video on how to create Great Photos using Backlighting. Click here to see a short slideshow on how best to take portraits in bright sun. Did you know that most Natural Light Photographers (those that only take people pictures outside) rely heavily on photoshopping their pictures after the shoot? Most photographers, in general, use software to enhance their photos. So before you buy a better camera, I suggest you learn some basic photo editing. You can download a 30 day trial of Adobe Photoshop Elements or Photoshop and try before you buy. You can use it with my email course. Not sure you want to mess with learning photo editing software? Sign up for my free 5 day mini email course anyway and spend a few minutes to see for yourself if it is worth it to learn. There is no obligation and you can unsubscribe at any time. Learning about photo editing layers will show you the secrets that pro photographers have been using for years to create stunning images and it is very simple and quick to learn. Click the button above and Sign Up for my free 5 day mini email course on Layers using Photoshop Elements. Sooner or later you will need to use flash for better portraits both inside and out. Check out my new on-camera flash course.